Do you rarely spend time in your backyard? Do you have a dilapidated deck or worn out patio? Do you hate wasting time and water to care for a large lawn? Is your backyard lacking space for entertaining? This large backyard makeover provides ideas for the beautiful marriage of multiple materials. No matter the challenge, an experienced professional with access to the right resources can help you take your yard from bland to beautiful. 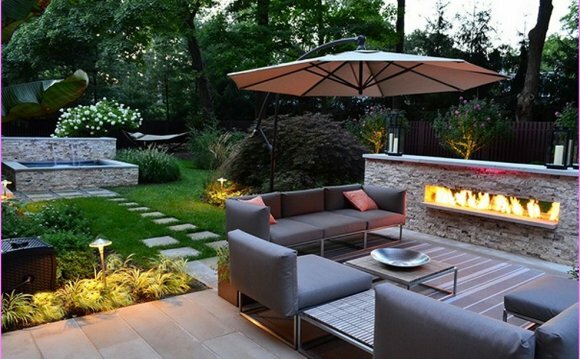 Check out the ideas below to discover how your backyard can be made over into an awesome outdoor living space. Replace Outdated MaterialsThis backyard was stuck in the '80s. It featured exposed aggregate concrete with brick bands. The concrete had settled in areas, so the patio was demolished and replaced with sand-washed, beige-colored concrete with bluestone bands. A fountain was also added with dry-laid flagstone surrounding it. To connect the patio with the new pool, a pattern of random concrete rectangles were poured. Enlarge Your Patio A common backyard mistake is making the patio too small. When working on a backyard makeover consider enlarging patio areas to accommodate larger furniture and provide walk around space. According to landscape designer Maureen Gilmer, "To err is human, but it is better to do so on the side of overly large than too small (check out more common landscape design mistakes)." In the video at right, garden artisan Scott Cohen discusses plans for remodeling an undersized backyard patio. Originally 10' by 10' the patio could not accommodate a table and chairs and leave room for the doors to open wide allowing people to comfortably walk around. Get more patio sizing tips from Scott Cohen. See how to dress up a plain-gray concrete patio with acid stains and then carve it to look like paving stone. Coordinating brick steps and borders complete the makeover. Remodel Your Paving Ordinary grey concrete can be quite boring. Giving your backyard paving a makeover will transform the feel of the whole yard. When redoing paving you have two options: tear out the existing pavement or dress up what you have. One option, seen in the video at right, is staining and engraving the concrete to look like natural stone. Opting to dress up your existing paving will save you money on materials and labor. Landscaping a narrow lot can be difficult, especially if the you want a pool, spa, fire pit, swing set, lawn, patio, and deck. Don't Let Small or Awkward Spaces Limit You Narrow lots can pose a challenge and often end up going unused. However, by working with a landscape designer or architect, you can turn a narrow space into a useable backyard fully equipped for outdoor living. Creative layouts and space saving techniques can be used to fit more features into a small or oddly shaped backyard than you realize. The video at right proves that you shouldn't limit yourself because of lot shape or size, go ahead and dream big for your backyard makeover, more than likely you will be pleasantly surprised with the results.